The hardest part of creating a memory box is gathering the right keepsakes. Touching something tangible can spark memories better than simply talking about something, so you should include any special items from their past. Find old pictures of loved ones or important events, souvenirs from trips and even childhood toys - say, a doll they used to play with or a baseball glove they used as a child. Put all of these items in a box or basket, and keep it in an accessible place. During times when your clients are feeling sad or disoriented, or even if they just want to share memories, take out their memory box. Have your client hold one item at a time and describe how he or she is feeling and any memories associated with it. Memory boxes are a great way to connect seniors with dementia to to their past. 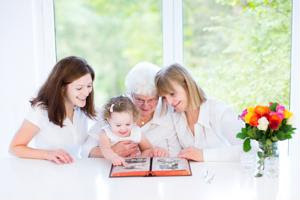 Invite your client's family to take part by looking at the items in the memory box with their parent or grandparent and sharing their own memories about each item.